This was inspired by both Ian and Cedar Mountain. Take 18 g of refrigerated starter and feed it 18 g of filtered water and 18 g of wholewheat flour. Let rise in a warm place (oven with one light on and door closed- 91F. ). Mill the grains and sift to obtain the needed amounts of high extraction flour. Save the bran for dusting the baskets as well as for another use. Place the high extraction flour in a tub and add the unbleached flour to it. Cover and set aside. Place the rice in a bowl and cover with water. Let soak overnight. Place the barley flakes and the hemp hearts in a heatproof bowl and add the honey, yogurt and 50 g boiling water. Cover and let sit overnight. Feed the levain 72 g of filtered water and 72 g of AP flour and let rise 5-6 hours in a warm spot. Drain the black rice. Add fresh water to cover by an inch and cook gently until the black rice is tender. This should take about 30 minutes. * Drain well. * Add to barley and hemp hearts soaker, cover and set aside to cool. Two hours before the levain is ready, mix the water with the flours on the lowest speed in the bowl of a stand mixer until all the flour has been hydrated. This takes a couple of minutes. Autolyse for at least a couple of hours. Once the levain is ready, add the salt, the add-ins and the levain to the bowl. Mix on one for a minute to integrate everything, mix on speed 2 for 5 minutes. This makes a very soft wet dough. Do 4 sets of folds at 30 minute intervals, then do another set an hour later. The folds really help strengthen the dough. You can feel the change right from the first set of folds. Place the dough in a cold fridge for 4 hours. The dough rose about 40%. Tip the dough out on a bare counter, sprinkle the top with flour and divide into portions of ~825 g. Round out the portions into rounds with a dough scraper and let rest one hour on the counter. Sprinkle rice flour, then hemp hearts and barley flakes in the bannetons. Place the dough seam side down in the bannetons. Let rest for a few minutes on the counter and then put to bed in a cold (38F) fridge for 9-10 hours. Nice oven spring considering how wet this dough was. Can't wait to see your crumb shot and hear how it tastes. Are the wheat berries a locally sourced variety? So happy I could inspire you. I have come to love adding rice to bread as my last post will attest to. Have not tried hemp hearts yet....need to add that to the list to pick some up. Do they add any flavor or just some texture? in Saskatchewan. I put in an order once a year and get 25 lbs each of a fairly wide variety of berries. This was the first time using what I call "regular type of rice" as I have used wild rice before. Hemp hearts add texture more than anything else but they do have a bit of a grassy taste. 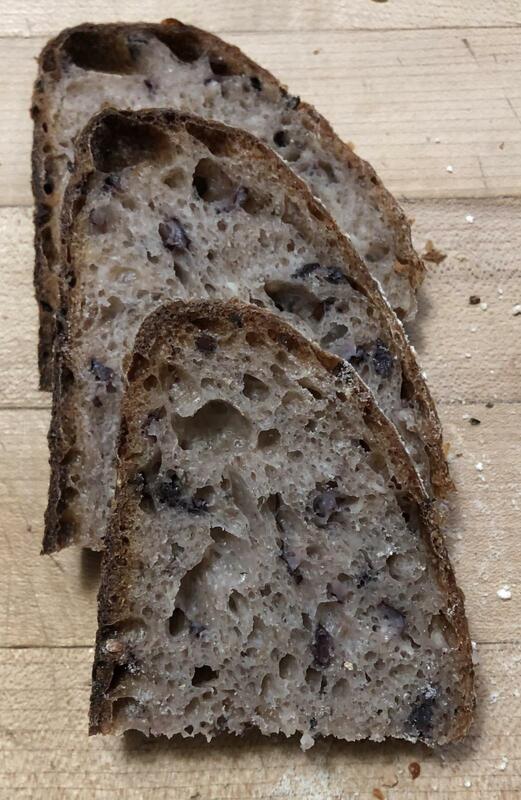 Crumb shot will be coming up! Love the gelatinous crumb....nice and open too. What a nice mix of flours add ins and flavors. Looks great inside and out as usual. 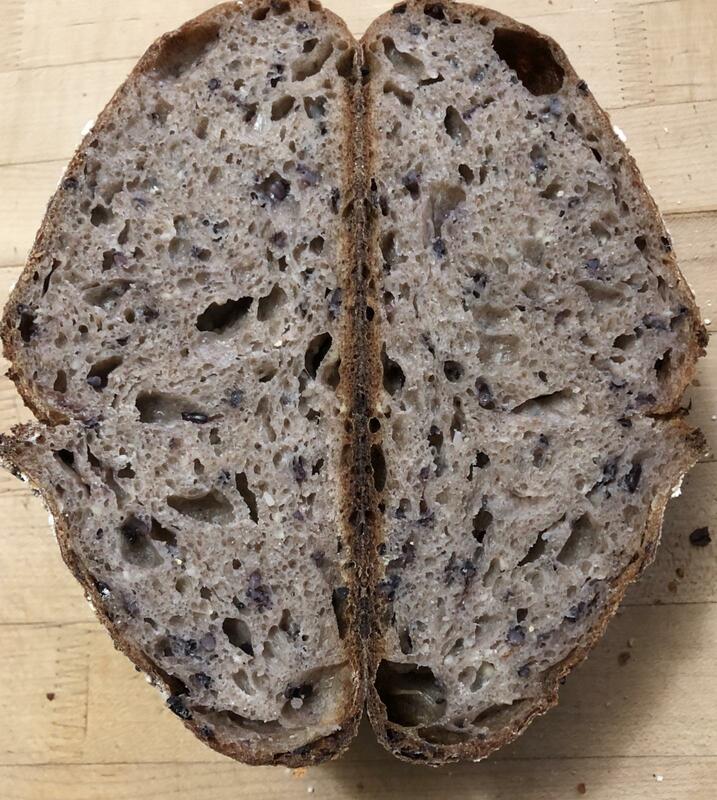 I like black rice better than white rice for two reasons, it has more flavor and you can see it better i the crumb making for a better looking loaf overall. This one has to taste as good as it looks. Well done and Happy Baking Danni. PS Thai Chef needs to bake 24 loaves in one day I assume 6 at a time. What mixer are you using now a days? Hubby and the daughter got together and got me this particular one. I wasn't consulted but I am very happy with it. all at once? That would be a feat for any KA! 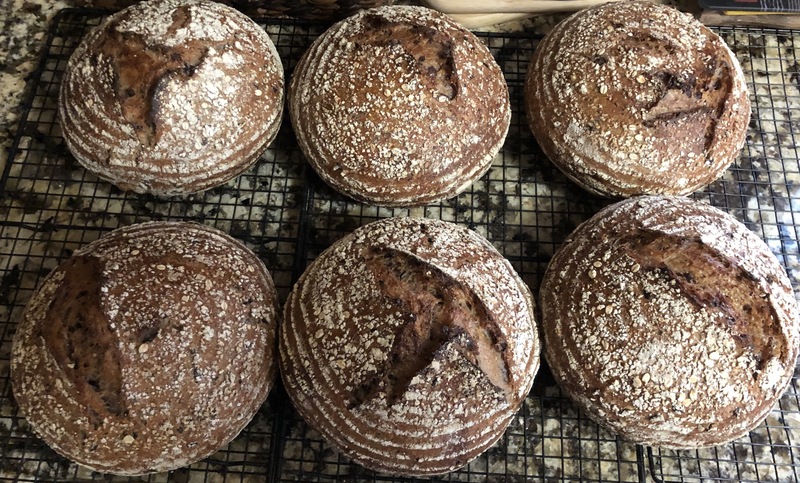 can barely do one whole grain loaf, and why it stays on the shelf except for some cookies and enriched white breads or ciabatta but even those I pretty much do my hand - just because it is fun and less to clean.